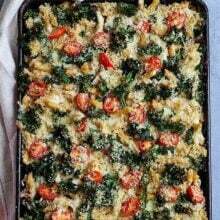 One Pot Sausage Pasta with onion, garlic, red pepper, kale, mozzarella cheese, and Parmesan cheese. This easy one skillet dinner is a weeknight favorite! This post is in partnership with DeLallo. Do you plan out your meals for the week or are you a 5:00 I better figure out something to make for dinner kind of person? I am a planner, with everything in life, and I always plan out our weekly meals on the weekend. Caleb has been helping me ever since he started doing his meal charts and he is so good about remembering to plan out our meals on Saturday. I am not perfect though. There are some weeks when I get super busy and don’t stick to the plan or I forget and have to scramble when the clock strikes 5:00 p.m. 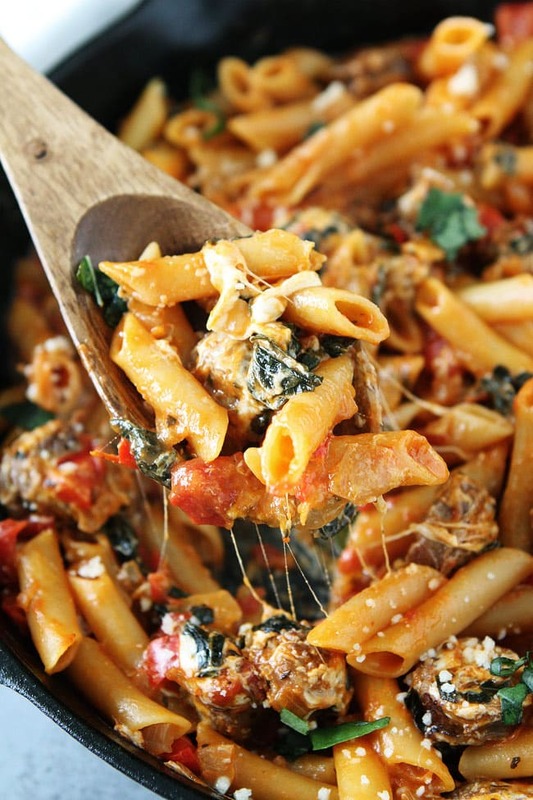 When that happens, I know I can always turn to this easy One Pot Sausage Pasta. It is one of my boys favorite meals and it comes together in no time. One pot meals and one skillet meals are lifesavers. 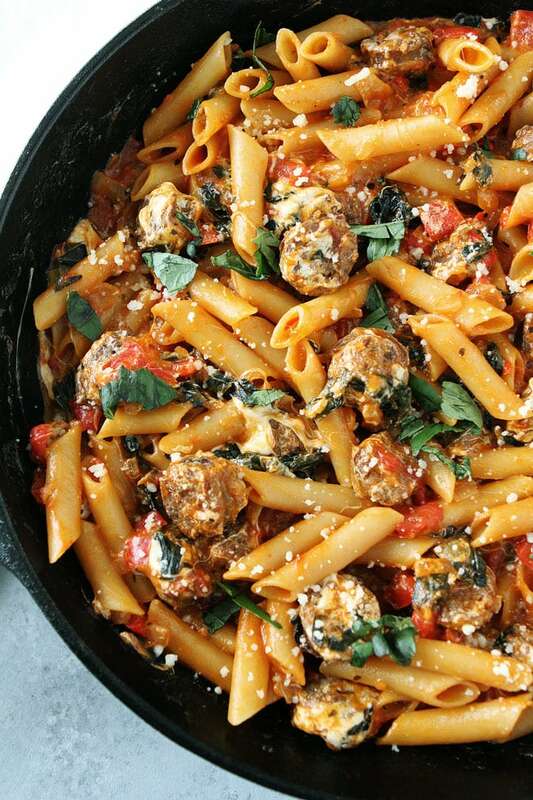 Add everything to one pot and voila dinner magically cooks itself. Ok, maybe not that easy, but close! DeLallo pasta is also a lifesaver because we always have it in our pantry and everyone loves pasta nights! With this recipe, you don’t have to boil the pasta first, it cooks right in the pot with all of the other ingredients. This easy one pot pasta recipe only takes 30 minutes to make so if you forgot to plan out your meal plan for the week, no problem! You can have this on the dinner table in no time! 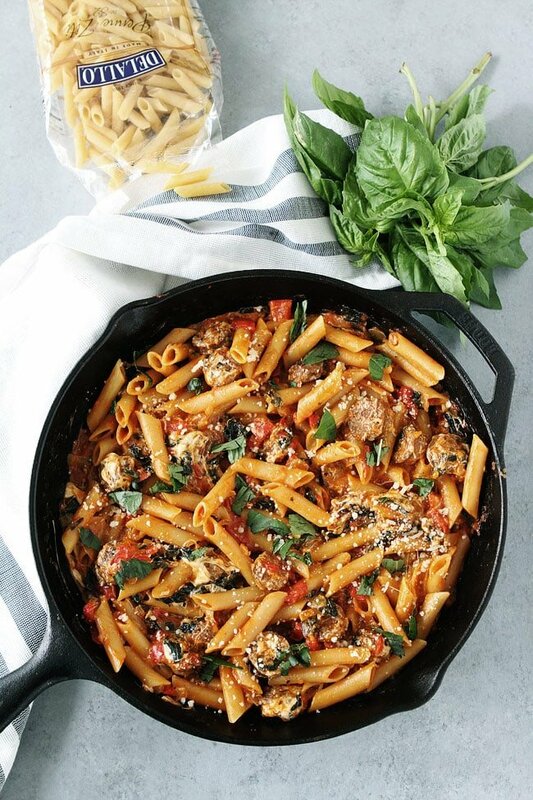 And if you are planning out your meals for the week, make sure you add this One Pot Sausage Pasta to the rotation. It is guaranteed to be a family favorite! 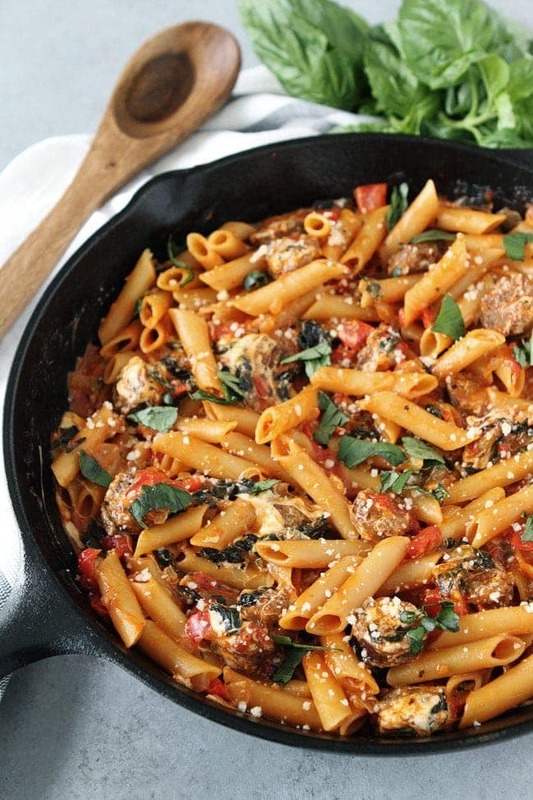 You can have this easy one pot sausage pasta on the dinner table in 30 minutes. It is a family favorite! Heat a large skillet or pot over medium heat and add the olive oil. Add the sausage slices, onion, red pepper, and garlic. Cook, stirring often, until the onion and peppers are tender and the sausage is cooked through, about 5-7 minutes. Add the tomato paste and stir. Add in the chopped kale, diced tomatoes, basil, oregano, and fennel seed. Add in penne pasta and broth. Stir until combined. Cover with a lid and cook for 8-10 minutes, stirring occasionally, or until pasta is al dente. Remove lid, stir and add in the fresh mozzarella cheese. Stir and cook until cheese is melted. Top with Parmesan cheese and fresh basil. Serve warm. Note-we like to use our 10-inch cast iron skillet. If you don't have a lid for your pot or skillet, you can place a large baking sheet over the skillet/pot to cover. 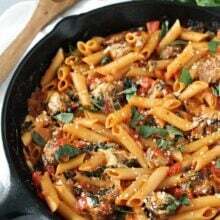 You can also use DeLallo's whole wheat or gluten free pasta in this recipe. I’m such a huge fan of one pot meals, especially when they look like this! We love one pot meals too! I love a one-pot meal and this one looks awesome! This one pot meal looks perfect for a pre-workout. Looks lovely, thanks very much. I love how quick this is! And you just made me want pasta again. Don’t you just love it when someone asks for substitutes? i can’t stand kale…would spinach work if you added it to the pot for a few minutes before adding the mozzarella? Yes, you can use spinach! Like you, I’m a planner in everything in life. We love meals like this in our house! I’d love to try this. Is there a brand of sausage you like? Have you tried Aidell’s? My boys like their sausage. Omg I want this, like, now. DeLallo is my fave. I love one pot meals! This looks so delicious. Putting it on the list to try! Love how easy this is to make! I’m usually a planner, but there are those days where I’m a 5:00’er! But, one pot meals are totally my jam. I love one pot dishes like this! Perfect for busy weeknight meals! Yes! It is a weeknight favorite at our house! Delicious! I made this tonight and used spicy italian sausage. So good and easy. Yay! So happy you enjoyed the pasta! This is so good! We loved it. I see a lot of it in our family’s future! Glad your family enjoyed it! Made this recipe last night. AWESOME!!! It was quick, easy and very tasty. I am adding it to our dinner rotation. Yay! So glad you liked the recipe! What kind of sausage dud you use? Looked really good. The boys like Aidell’s or smoked sausage. Awesome stuff. Great and easy. Taste wonderful. It was very good and so easy! I used chicken sausage. Will make again! Yay! Glad you liked the pasta! Made this One Pot Pasta Sausage today. It did not disappoint. Awesome!!! Yahoo! So happy you liked it! I’m not a huge sausage eater, what could replace it or at least suggestion for a mild nice sausage!? If you don’t like sausage you can leave it out. It will still have lots of flavor! Made this for dinner- so incredibly good!!!!! I like this red pot, is it cast iron? Where can i buy one? Thanks! Awesome post and your all recipes are good, I loving it. I am a big fan of penne pasta and all kind of Italians foods. This is a super fast delicious meal! Another Great way to get my almost 2 year old daughter to eat Kale. Thankyou so much. I have made this several times and we love it. I love using the little balls of mozzerella so yummy…. Wow, I like to eat Pasta. I will make this dish to replace rice meal. Recently I am quite bored with rice. Thanks for sharing the recipe. 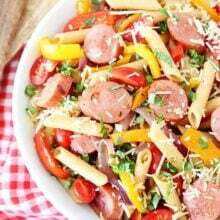 It’s a great recipe idea and has a great taste in this sausage pasta. I appreciate your tasty recipe ideas. 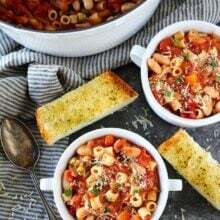 This is a great recipe as it can take so many substitutions like tonight it had green beans, no yellow pepper, no tomatoes, extra garlic and beef instead of chicken stock (plus extra stock as we ran out of tinned tomatoes) and cheddar cheese works best for us. Once its past 5:30pm you need something flexible!! Made this for dinner- so incredibly good!! Wow, it looks delicious. Thanks for sharing the recipe and the photos shows the detailed process to make this dessert. This was a fantastic, easy and quick weeknight meal. Really wonderful flavors. Thanks! Whoops – that was supposed to be a 5-star rating up there! Full of color and flavor! Easy to make and requested over and over. I have always used spinach instead of kale and cook the pasta separately. Some day I will make it as the recipe instructs and may love it even more! My 5-year-old boys loved it! I will definitely be adding this into the dinner rotation. I used ground sausage instead of sausage slices and added a bite more Kale. Was delicious! I made this last night using spinach & feta chicken sausage. So delish! Absolutely delicious! Going on our rotation. Thanks for all the great recipes! I’m always recommending friends to your site. So appreciate all you do! Just made this and it was great! I’ll correct that – my husband just made it, so added bonus there. This tastes good! Mmmmmm yummy! What a delicious dish! What a Pasta! Is the sausage already cooked? Lyne, Yes, we use Aidells Italian sausage and its so easy! Make this all the time- one of our favorites! Great dish! We like a little heart in our pasta, so the only thing I added was a pinch of crushed red peppers. Otherwise I followed to a tee. Wonderful! Fix your technical problem with Fixingblog. We are also providing help for Belkin range.If you have any problem With Router, Range Extender, Antivirus etc. I love past..! Thank for sharing this beautiful dish. 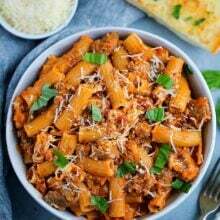 Nice post about the recipe of Sausage Pasta thanks for sharing. I’ve made this twice and it’s amazing! My husband is a picky eater and he loved this. Great recipe and super easy to make. Highly recommend this to everyone! Just made this for Sunday dinner, my husband loved it. He asked me if it was hard to make, so that tells me he would like it again. Very tasty and a keeper. Do you cook the sausage before or use raw sausage? This is on my plan for this week cant beat a one pot meal!! Thanks for Sharing Good Article. Thanks for good post. We are providing Dell support. If anyone have technical problem related to Dell products then call Dell support team. Tasty though needed a bit more oomph of spice for us. We followed the recipe in general, used mild Italian sausage that we’d BBQ’d, canned fire roasted tomatoes, and fresh basil and oregano from the garden. The addition of kale was a nice touch. Next time will try spicy Italian sausage. When you deal with my Belkin router is blinking orange and blue light it can be due to several reasons. check out this article and follow the instructions to fix the problem. My husband and I just finished devouring this, and we both agree that it’s absolutely delicious!!! Thanks for sharing information about one-pot sausage pasta. This is delicious I make this last Saturday. 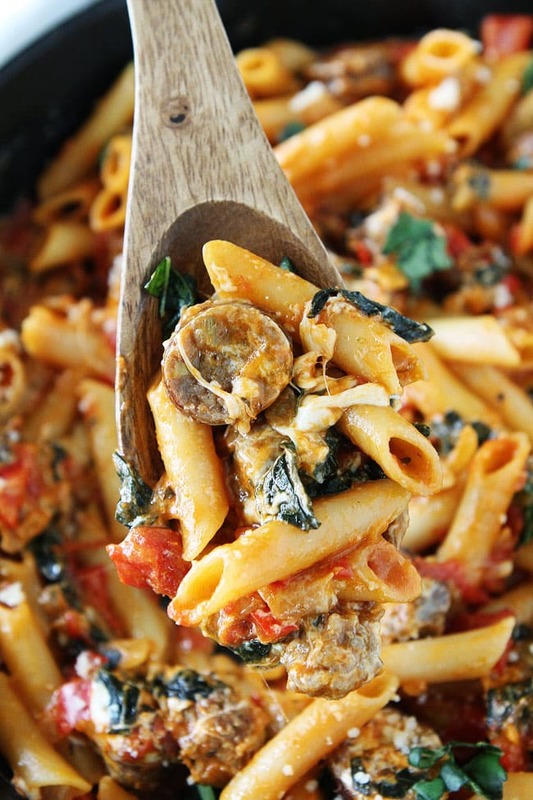 This post shares information about one-pot sausage pasta. This is a delicious recipe I make this last Saturday. This was so good my family loves . we added a little more seasonings to it and its been a big hit. I made this tonight and there was way too much sauce. I’m wondering if the recipe is correct ? Should it call for 1 lb of pasta vs 8 oz? It was a tasty dish using spicy sausage. I just made this for dinner tonight and it was delicious! My husband loves it. Made a couple of changes since it was what I had on hand – spinach for the kale and added fresh mushrooms. Thanks for the recipe – so quick and easy. I’ll definitly make it again! Delicious, we loved it and we have leftovers! This sounds wonderful!!! The ingredients are going on my shopping list right now and will make it soon. I am going to to try to sneak the kale in but the vegetable detective will probably spot it and I will get a comment about it. it is looking so yummy pasta i loving it .